La Digue, the third largest populated island of the Seychelles is described by the visitors as the most beautiful island of the archipelago. White, deserted sandy beaches, granite boulders, half a million of coconut trees, oxcarts and a welcoming population of 2000 dominates this gen of the Indian Ocean. 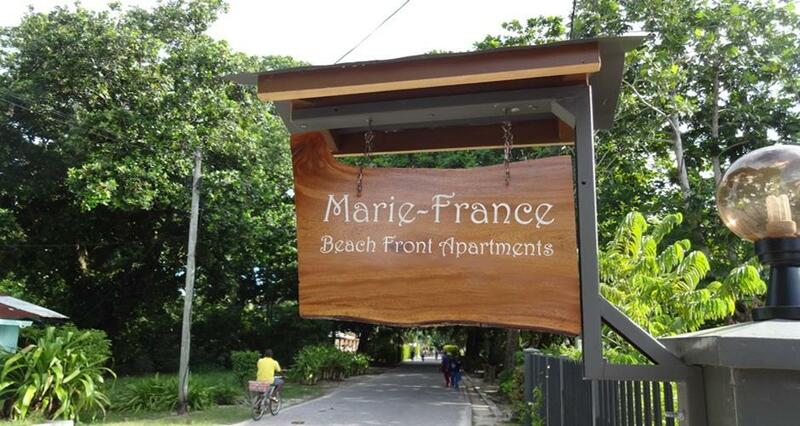 Experience the "horizontal" lifestyle with us at the newly built "Marie-France Beach Front Apartments" located at La Passe, right on the beach, barely 5 minutes walk from the jetty, and within walking distance to the World's famous "Robinson Crusoe" beach of Source D'Argent. Our 3 bedroom apartments located on the first floor, are nettled amongst the badamier trees in a quiet area with dominating and breathtaking views of Praslin and consist each of air condition, mini fridge, microwave, hairdryer, TV, safe deposit box, tea/coffee facilities. However, our experienced chef, Rhuddy will be available to cook your succulent home made local gourmet diners and breakfast from our dining area on the ground floor (almost "pied and l'eau"). Most of our clients choose to dine with Rhuddy. From your bedroom and terrace you can enjoy the splendid and magnificient views of the sunset as well as watching local fishermen coming in with their catch of the day on the beach right in front of your apartments which is no better place to enjoy the moonlight. Excursions to the neighbouring islands, as well as fishing and bike rentals can be organized by your host.